Before spring break, West Albany High Schools earned a distinction by Special Olympics of Oregon for inclusiveness. The school was named an Oregon Unified Champion School. 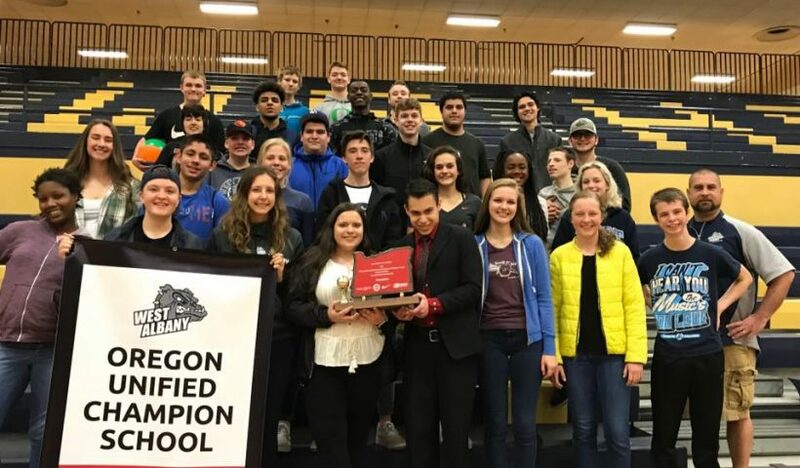 Representatives from Special Olympics presented the school with a Unified Champion banner during a school awards assembly, where they were also presented with the OSAA Unified Basketball Championship trophy for prevailing in the recent unified basketball tournament. The Unified Champion award honors schools for creating a socially inclusive climate. “The Unified Champion Schools approach incorporates Special Olympics sports, leadership and related activities that empower youth to be change agents in their communities. This is a paradigm shift from a focus on events to that of a whole school movement for inclusion.